Are you Team Glitter, or Team Neon? Pick a side and head out into the city for Big Night Out on Thursday 12 October. This is your chance to experience all the nightlife Southampton has to offer with nine brilliant venues, including Orange Rooms, Switch and Buddha Lounge. You can even take a look at our handy map below to plan the best route. No need to stress over what to wear, we provide your t-shirt, which also acts as your ticket. All you need to do is stock up on some neon paint or glitter! 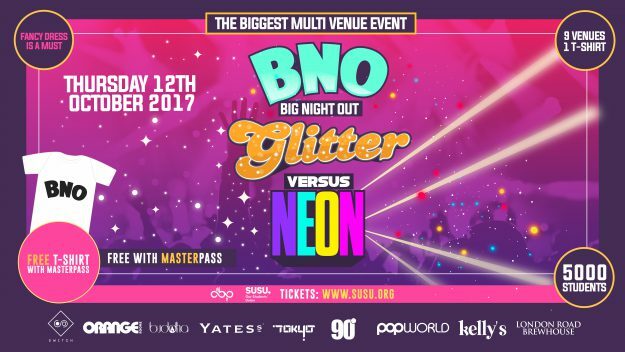 This is the BIGGEST multi-venue event and tickets are selling fast, so be sure to get yours before it’s too late from susu.org/boxoffice*. Let us know you’re going on the event page here. See you there! *This event is FREE with the Master Pass, but individual tickets are still available.